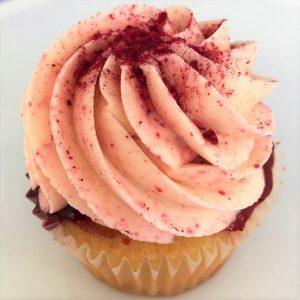 Our Raspberry Ripple cupcake features a raspberry flavoured sponge with hidden raspberries inside! It has a layer of raspberry jam and is finished with raspberry icing and a sprinkling of dried raspberries on top! We can make this flavour gluten free and/or soya free on request. Please note that we do use gluten and soya in our bakery, so we cannot guarantee against trace amounts.